Once the countryside home and headquarters of Pablo Escobar, Hacienda Napoles is slowly being remade into a family-friendly, safari-themed weekend destination. It’s an odd transition, and as I toured the grounds late last year, I wondered if the Colombians there felt the same way. Located four hours east of Medellin, Hacienda Napoles occupies 20 square kilometers of southeastern Antioquia, midway between Medellin and Bogota. 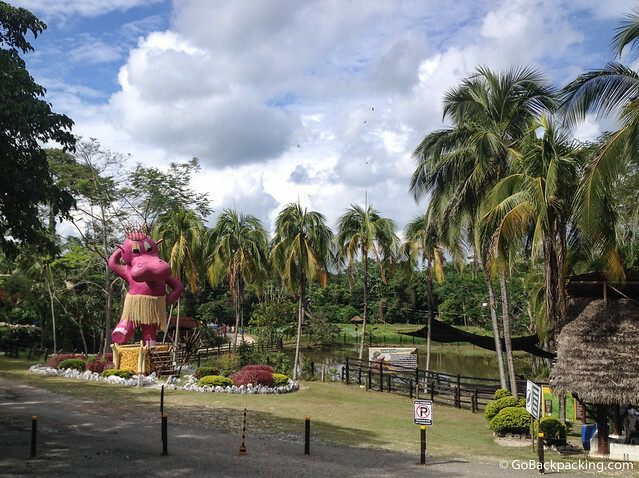 After spending the night at the Rio Claro Nature Reserve, Eric and Karen dropped Viviana and I off in front of Hotel El Lago, conveniently located across the street from the entrance to Hacienda Napoles, after a quick 30-minute drive east along the highway. We checked into the hotel, bought our basic park tickets for 32,000 pesos ($16) apiece, and had reception call a rickshaw driver to pick us up. Unless you’ve got a car, this is a necessary step, as the park is located a good distance from the road. You wouldn’t want to walk it, especially carrying luggage or backpacks. Once in the park, it’s feasible to walk, but everything is so spread apart; I’d at least recommend renting a bicycle if not hiring a rickshaw. Don’t forget, the elevation is much lower here than in Medellin, so it’ll be hotter too. A full day with the rickshaw will run you 50,000 pesos ($26). If you don´t have time for a multiple day visit, you can coordinate with Latin Hosts for a private tour from Medellín. 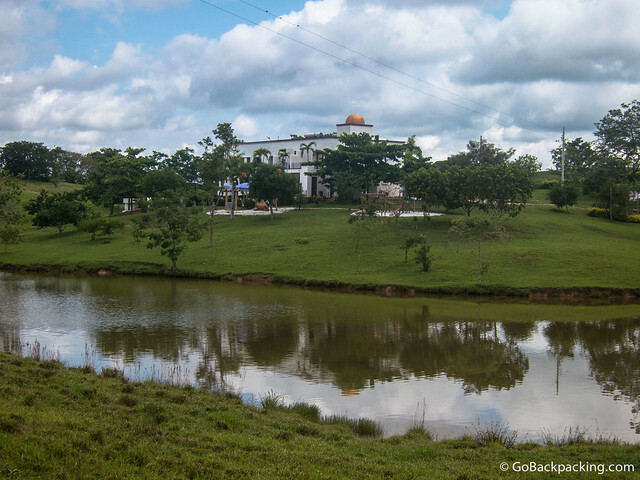 Its a long drive, but it allows you to experience the Hacienda and see the countryside of Antioquia. As we drove deeper into the park, a newly constructed maximum security prison could be seen over hills in the distance. I’m sure it’s no coincidence that the Colombian government chose Pablo Escobar’s former land upon which to build a prison. The land was hilly and green, and dotted with numerous manmade lakes, some of which are still home to the largest population of wild hippos outside of Africa. Pablo Escobar’s wealth knew no bounds, and as he grew in power, he began importing exotic animals like hippos, giraffes, elephants and ostriches. 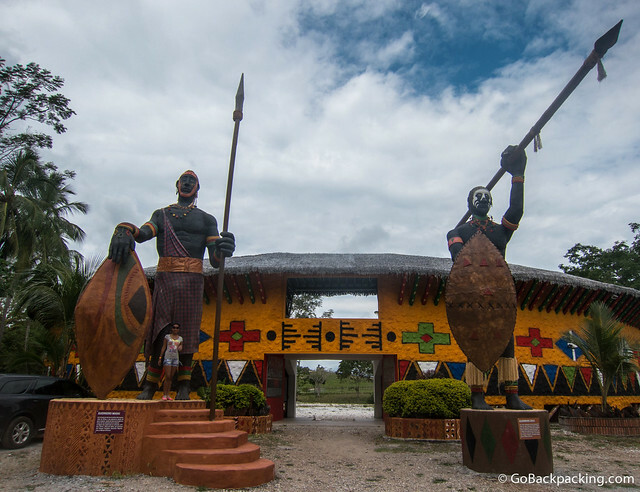 It is perhaps for this reason that the estate can be so easily branded as a safari-style theme park. 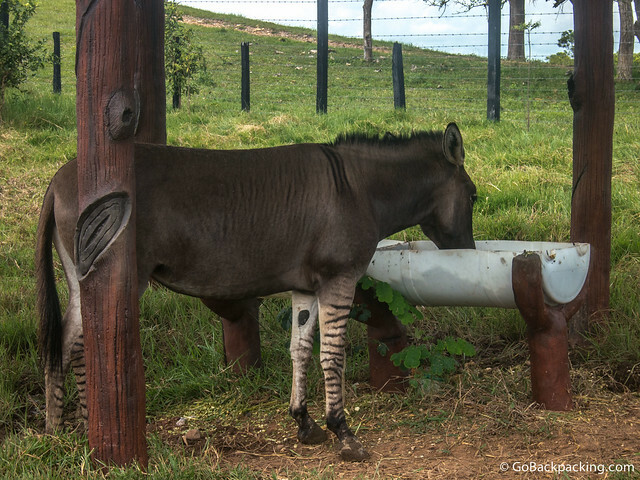 When the Colombian government finally went after Escobar, he abandoned Hacienda Napoles, leaving many of the animals to die of starvation. Those that survived were relocated to whatever zoos would accept them. The exception were the hippos, which had turned feral and reproduced like bunnies, to the point where finding suitable homes for them all became too difficult. 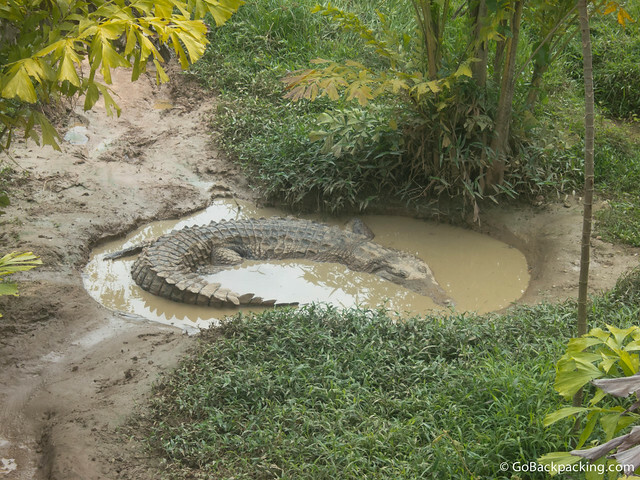 Now that Hacienda Napoles is being turned into a theme park, more and more animals are being reintroduced. 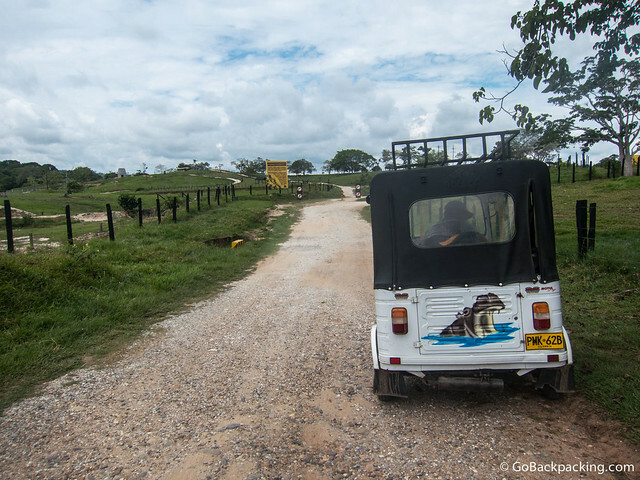 At the time of our visit, the park was waiting to receive three elephants. 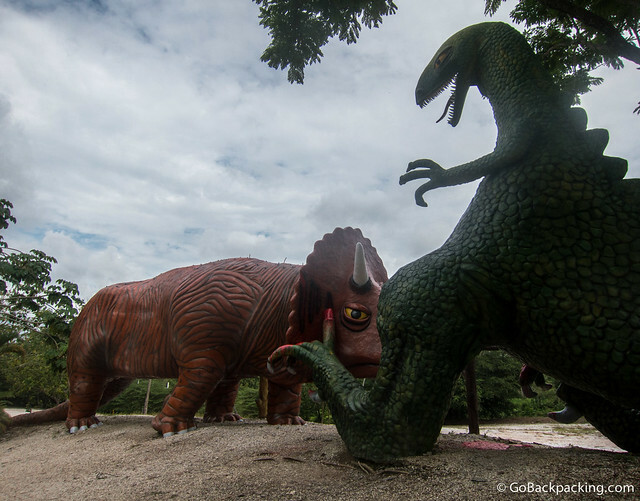 Before reaching the animal enclosures, we passed the dinosaurs Escobar had constructed for his son. My favorite was the T-Rex, which looked more like a caricature of Godzilla, fighting a Triceratops. Next, we stopped by the old bull ring, which has been chopped in half and redesigned as an African museum. 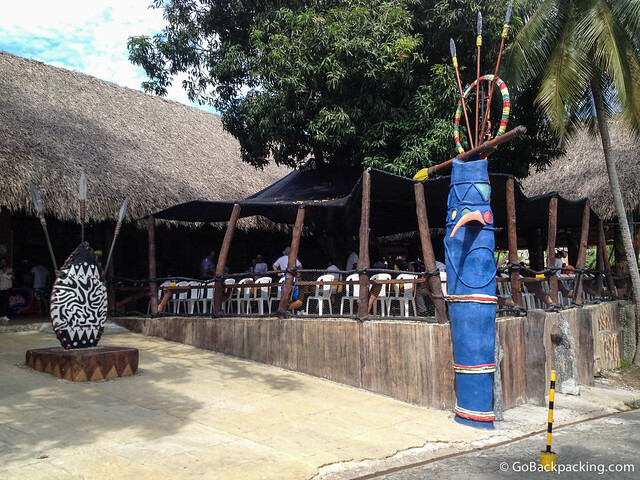 Not only did Escobar host his bullfights here, but the ring was used for other forms of entertainment, such as musical performances. As silly as the outside might appear, the interior was nicely done, but I still would’ve rather seen the bull ring in its original state. 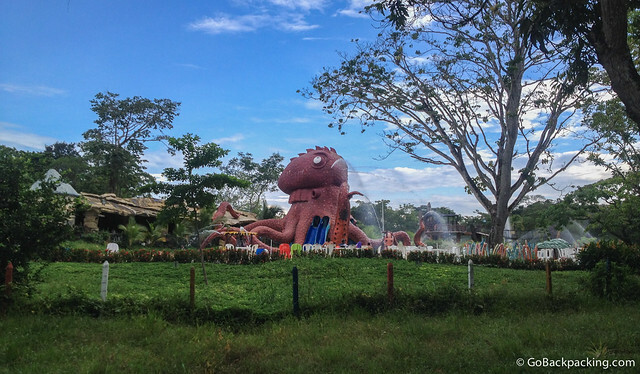 Across the dirt road from the bull ring is the Acuasaurus water park. Paying for a more expensive ticket can get you access to this park, but it’s best left for families. The first real animals we encountered were a rhino, zebra and ostriches. There were also two pairs of tigers and lions, all of which looked hot in the mid-day sun. 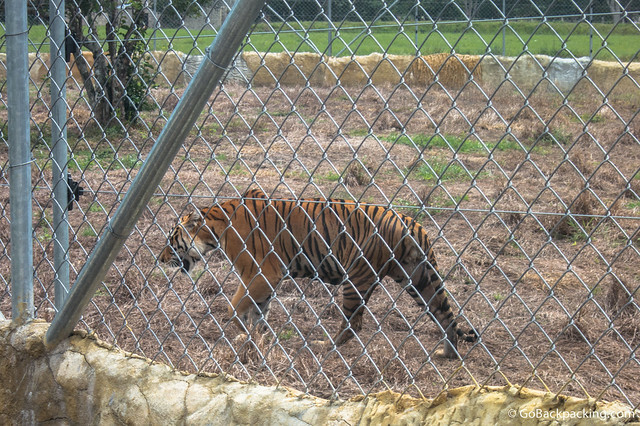 I always like to see big cats, but I felt a little sad to see them locked up on this occasion. They had enough space to run, which is more than I can say for some zoos I’ve seen, but there wasn’t a lot of shade in their enclosures. The rickshaw driver dropped us off outside a building with snake and butterfly displays. Before we looked at either, we walked over a bridge to peer down on alligators sleeping in the mud, and drifting through the murky pond water below. 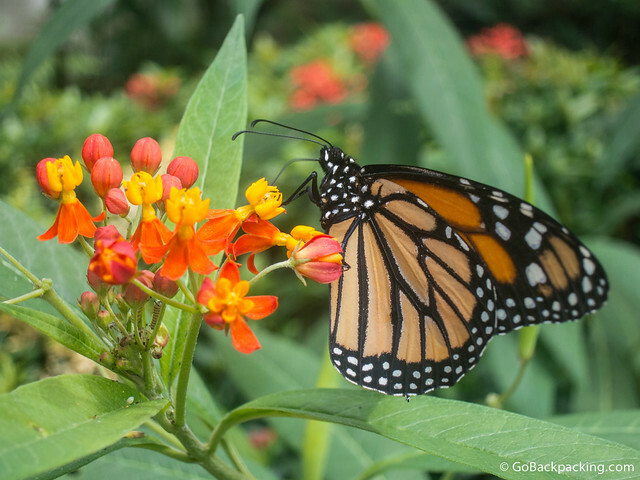 The butterfly enclosure was wonderful. The snake enclosures were what you see at any zoo. There was an anaconda on display, but we were unable to see it. Around this time, my camera malfunctioned. I was frustrated, but there was nothing I could do except rely on my iPhone for the rest of the day. We took a break from the sun to get lunch at the cafeteria. Adjacent the cafeteria is Rio Salvaje (Savage River), which was the second water park on the grounds, and quite popular by the looks of everyone enjoying it. 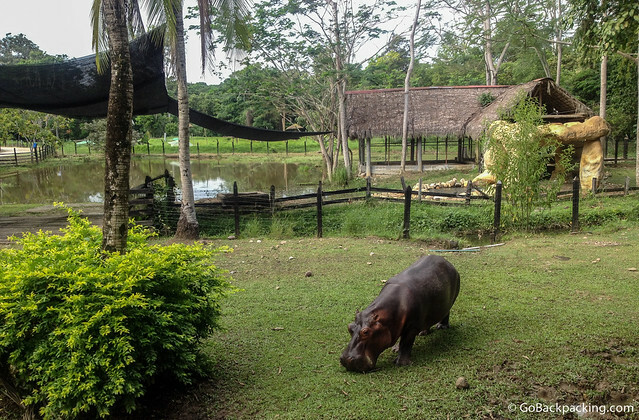 Our next stop was a visit with Vanessa, the hippo mascot of Hacienda Napoles. She was hand-raised from birth and is, therefore, used to being around people. The sign even indicated she answers to her name, which leads to no shortage of visitors yelling “Vanessa” in an attempt to get her out of the pond. And, believe it or not, it worked! She left the pond and came over to a viewing platform where a bunch of visitors had bought raw carrots to feed her. It was at this point that Viviana fell in love with Vanessa though one look into her mouth and gaping wide gullet made me wonder what was so cute about hippos. 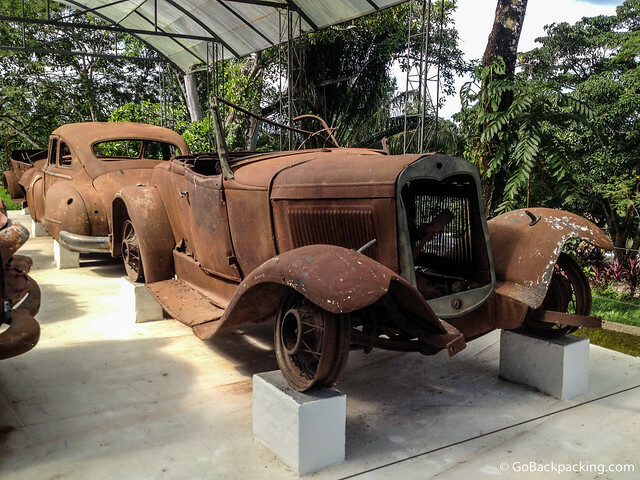 Across from Vanessa’s pond, and up a small hill, sits the remnants of Pablo Escobar’s antique car collection, much of which was damaged or destroyed when the Monaco building where he was living in Poblado (Medellin) was bombed by the Cali Cartel. You can also see some of his toys, including an early jet ski and mini-hovercraft. 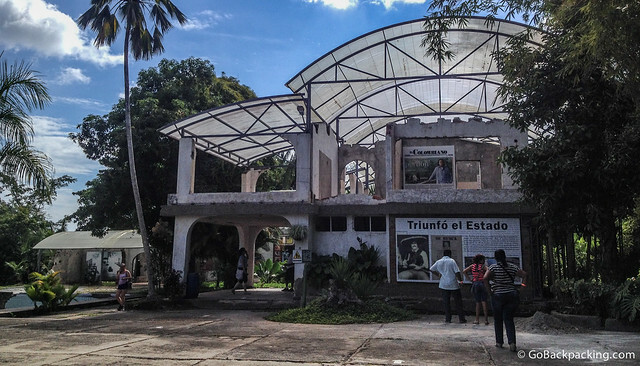 “Triumph of the State” reads the giant poster that greets visitors who walk past the ruined cars to Escobar’s former home. Three pictures are displayed, including Escobar in the giant Mexican sombrero, his mug on a Wanted poster, and finally, his body on the rooftop after he was killed by police. Another poster nearby reads that the structure will not be restored because it is technically difficult, and morally impossible. And I believe that’s the right call. It’s far more effective to leave the home in ruins. Inside the rooms are various news images reflecting the terror and violence Escobar unleashed across Colombia. It has a somber effect, as one is reminded of the evil plots he must’ve been forming from this very house. 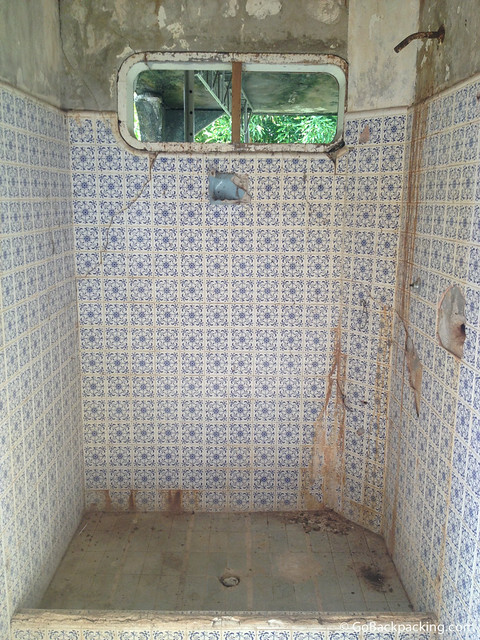 There were a lot of showers on the first floor, and every time I passed one, I noticed the tiles that were used. I wondered whether his wife picked out the designs herself. The experience reminded me of my walk through the S-21 prison in Phnom Penh, where thousands of Cambodians were tortured and killed during the genocide. From the immense pool, which was drained and in disrepair, as well as the entire front of the house, one had a clear view to the helipad and runway. Escobar was able to quickly and easily travel between Olaya Herrera Airport in Medellin and Hacienda Napoles via his helicopters and planes. The other members of the Medellin Cartel would’ve also been able to arrive this way. In the miniseries, Pablo Escobar: El Patron del Mal, they even depict him flying in Brazilian prostitutes to party with while his wife is at their home in Medellin. The distance was good for not only keeping the police at bay, but also his own wife so he could carry on illicit affairs. 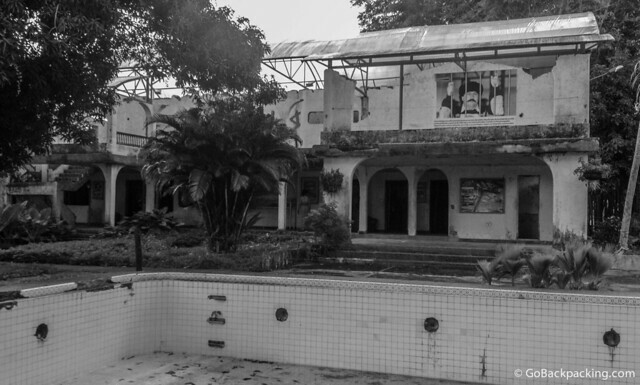 The ramshackle house was my main reason for visiting Hacienda Napoles, but I can’t blame the government for trying to turn the page on a terrible chapter in Colombia’s history. Update: In February 2015, Escobar’s old house partially collapsed, and for safety reasons, was then demolished. If you don’t have the time to visit Hacienda Napoles, but still want to learn more about Escobar during your visit to Medellín, sign up for a half-day tour through Latin Hosts Medellín. Historical points of interest include the Monaco Building where the Cali Cartel tried to kill him, his last safe house where security forces did kill him and his family grave. It’s time for them to take down the plane, the gateway and anything that has to do with Escobar at that location. How can you put a family-friendly theme park in the same place? What kind of message are you sending? All these kids probably think the park is a gift from Pablo Escobar. He needs to be wiped off the map not glorified like this. It’s so inappropriate. He was human garbage, a complete sociopathic psychopath. What he got was so much more than he deserved. He should have been raped by pigs and set on fire in front of the entire country. Get your facts straight! Read “My Father Pablo Escobar,” the biography by his son, especially the first chapter. The plane in the entrance was not used to smuggle cocaine. It was a present from an old friend. Absolutely fascinated with Pablo Escobar and his life, I would have loved to spend a day with the man himself. The stories the man could tell you…! What ever happened to his family and friends…..? Hello, David. Thanks for a great post. On YouTube, I watched how was Hacienda Napolis in past. To be honest, it was truly gorgeous. Pablo knew how to live a truly luxurious life. Nevertheless, today it looks even much better.Especially, the swimming pool. 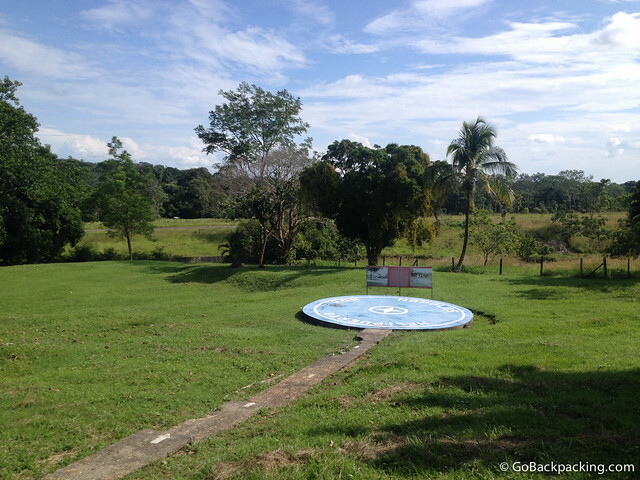 Hacienda Napolis is a historical place. Medellin is mainly associated by Pablo. When I go to Medellin, I will definitely visit this wonderful place. Dave, thanks for your article! How do I get there from Medellin? What bus can take me there? Do I need to book a place to stay in advance or can I book when I am there? The prison was built by Escobar as part of some agreement with the government and is where he served is 5 year prison sentence, that was a farce.